Amazing Spider-Man #229 and #230 are two of the best comic books of all time. According to me. And more than once. And yet, the legendary run by Roger Stern and John Romita, Jr. has never been collected in color. I first read it when I was 12 and it popped out on the newstand. I was a regular Amazing Spider-Man reader, so I didn’t put any thought into it, but I had no idea who Juggernaut was (and he really wasn’t a major character at the time), or who that Black Tom character was who seemed to boss Juggy around. I wasn’t a big Madame Web fan, either, so I started out reading the book slightly annoyed that she was to play a major role. And it started with a dream/hallucination sequence, so there were quite a few strikes against the book before I even hit page 10, when Juggernaut rises out of the Hudson and begins an epic, two-issue march through Manhattan. And that’s basically the whole story–Juggernaut takes a walk, and Spidey tries to stop him. But the “trip” gives John Romita, Jr., a lot to play with–images of Spider-Man’s textured webbing getting stretched to the fullest (and used in a myriad of manners), and this great panel at right, which I’ve stared at for I can’t imagine how many minutes over the years. It similar to what Frank Miller was doing in Daredevil at the time–eschewing motion “lines” in favor of multiple, slightly faded images of the character in motion. It’s almost like little frames from a flip picture. But it shows how great Romita, Jr., can be when he’s in touch with the form of a particular character. You can see Spider-Man’s unique fighting style, and it’s in great opposition to the static image of Juggernaut–a slow-moving, hulking force. 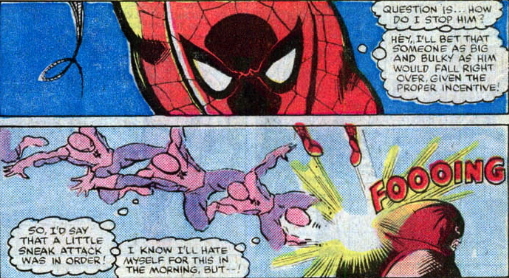 Roger Stern used Spider-Man’s infamous sense of corny humor to its greatest effect by focusing not on one-liners and insults but on Peter Parker’s attitude and approach to problem solving. In the panel below, we see Spider-Man telling Juggernaut how he’s going to rip off his helmet. It’s not laugh-out-loud funny, but there’s a real sense of warmth and charm–that Spider-Man doesn’t take this battle personally (even though by this time he’s already had a building dropped on him) or too seriously (and all of us readers know Spider-Man will survive–and win–because he always does). I won’t give away the end, but the story also shows how Stern allowed Spider-Man to be a creative fighter. He recognized that Spidey wasn’t an icon like Captain America or a powerhouse like Thor, he was just a man with some overdeveloped strength and agility.